In this update we wanted to show off in video format the new Flight Modes you can expect to see in the upcoming Alpha release. We’ve split them into two categories; Vector Modes and Orientation Modes, so you can mix and match which ones you’d prefer. Be sure to watch the video demonstration to get an idea on how they work! Here is also a break down of these flight modes and how each of them work. You can access all of these modes via the Flight Mode Radial Menu by holding the “V” key. Throttle Vector is the stock method of propelling your ship. Use your Forward/Reverse buttons to set a desired throttle percentage to engage your main engines to thrust you forward at a set rate. You can augment your vector using the 6 degrees of freedom to shift your ship in other cardinal directions using the other directional keys, but will focus on maintaining the forward thrust direction and will not maintain sideways momentum unless you hold down the augmented directional input. This mode is best for the fastest forward acceleration and also long distance travel. This mode can be seen on the HUD as the letter [T] in green below the throttle. Newtonian is the re-branded name of “Drift Mode” where you maintain your moment from your velocity and drift in that same direction. You will be able to add/remove momentum by pressing the direction you wish to travel and your thrusters will fire in that direction, either accelerating or decelerating your velocity in any given direction. Note: This Thrust is affected only by maneuvering thrusters and not your main engines. Default Key to toggle this mode on and off is from the “Z” key. This mode is best to trigger a “fly by strafing” maneuver where you may aim your ship to the side while maintaining your momentum. Also great for turning around and shooting targets behind you if you are in a fast moving fighter craft. This mode can be seen on the HUD as the letter [N] in purple below the throttle. This new vector mode takes the similar approach to Newtonian Vector, but adds one element where you will come to a (relative) stop when not providing any input direction. When pressing a directional input, your maneuvering thrusters will engage and push you in that direction, but one released, your thrusters will proceed to decelerate your velocity to a stop. Default Key to toggle this mode is using the combination of “Ctrl + Z”. This will toggle you between Throttle Vector and Direct Vector. “Z” by itself will toggle you to Newtonian Vector and back as well, allowing for all modes to be accessible at your finger tips. Direct Vector is best used when navigating through tight spaces like a Mega-Meteor or setting up for Docking. 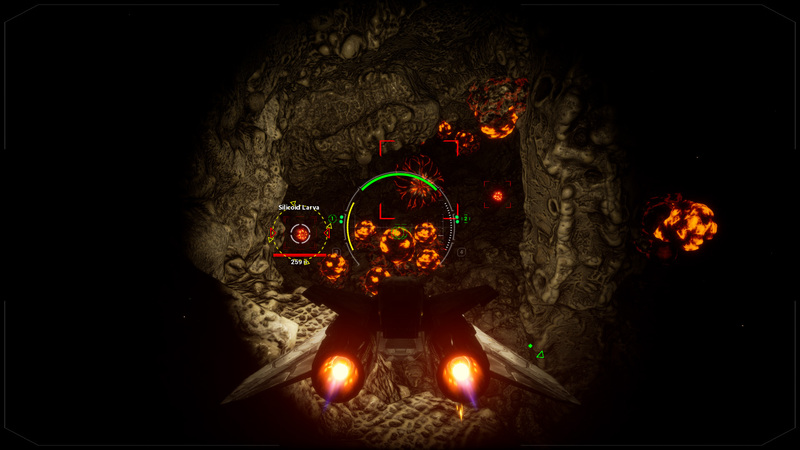 This mode can be seen on the HUD as the letter [D] in blue below the throttle. 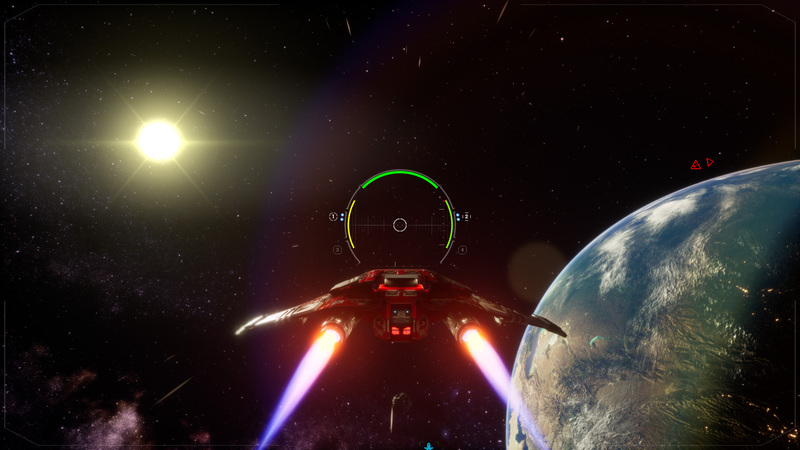 Pressing “Ctrl + F”, your ship will toggle the Direct Vector mode and also initiate a “follow” mode where it will attempt to match the Velocity and Direction of the target so you may have an easier time keeping up with the target. Currently you are able to do this with any Targeted object on your HUD. This will allow you to also use the Direct Vector movement behaviour to circle around your target while maintaining the same vector of the target. You will then also return back to the same vector (no matter how your ship is facing) when you let go of your inputs. Note: If the Target’s Vector is greater than what your maneuvering thrusters are capable of, then you won’t be able to match their velocity and you will fall behind them. This mode is currently set to automatically toggle on when you approach close enough to the entrances of a Mega-Meteor, allowing you to move relative to the Mega-Meteor on the inside. “X” key has been setup as a sort of “Braking System” where no matter which mode you are in, you will come to a full stop based on the thrust power of your maneuvering thrusters. To resolve alot of Physics issues, we have refactored the Ship flight mechanics to be calculating Force and apply that acceleration on ships rather than specifically declaring velocity. This helps us in the long run by allowing the Physics engine do what it does best (such as allowing the ship to be pushed by other impulses such as explosions or recoil) as well as help optimize movement for Single Player and Multiplayer. This is the standard mode where your Crosshair is allowed to freely float on screen and allow your gimballed weapons to aim in the direction you choose first before your ship attempt to orient in that direction. This method is great to use with ships that have gimballed weapons and you have a precision control device (like a mouse) to use it with. This mode allows you to look all 360 degrees around your ship, and if there are any turrets that can match where you are aiming your crosshair, they will also aim in that direction. This method is best used on larger vessels that have multiple weapons that may not face forward and/or great for directing point defense weapons and shooting at close range targets. This new mode fixes the Crosshair to the front of your ship and any rotational input given is given directly to the ship, much like other flight simulators. This mode is great with directional input devices such as gamepad or joysticks. This method is also much more helpful for ships with fixed weapons such as the Hyperion or the Osprey. Rotational Lag Sway – In larger, slower to rotate ships, your camera would over compensate for the rotation and “sway” in the opposite direction which looked extremely weird. This is now fixed where the camera just inherits the rotation and lags properly behind. Roll Override – In Floating Crosshair, your ship will naturally roll when yawing to the sides to give a more dynamic feel to your ship, but you weren’t able to counter act that roll via inputs. Now you can. Thanks again for tuning into this Development Update. We will see you on the next one! 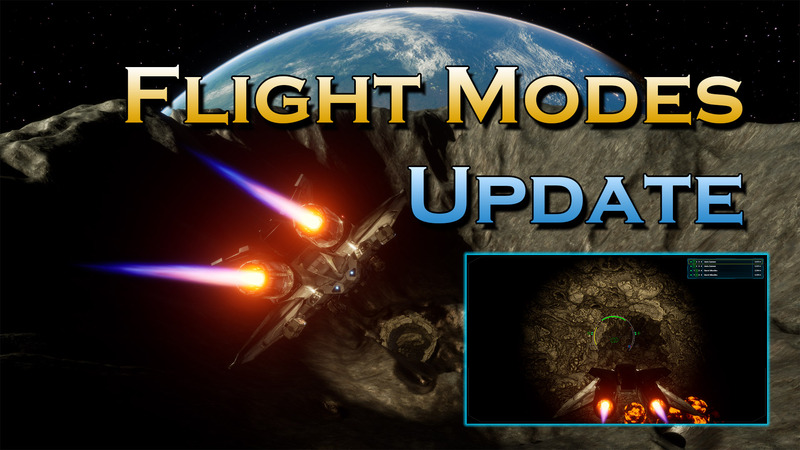 0 Comments ON " Dev Update – Flight Modes "